Wynyard (pop ~5000) began life as a fishing port. Its location, a short distance from many attractions, has turned it into a tourist centre with excellent accommodation facilities. Burnie Airport, located in Wynyard, is the north-west coast's major airport, with regular flights to Melbourne and sightseeing flights over the west coast and Cradle Mountain. 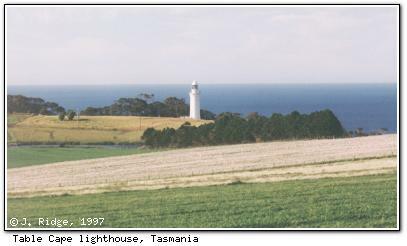 Table Cape (right) is possibly the best-known Wynyard landmark. 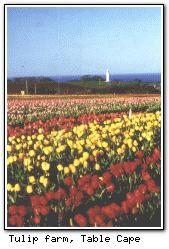 On top of the cape, visit the tulip farm (below) and historic lighthouse (above). At Fossil Bluff you can look for fossils in the cliff face at low tide (please do not remove any). Australia's oldest marsupial fossil (Wynyardia bassiana) was found at Fossil Bluff. Wynyard offers trout, fly and sea fishing; has two golf courses, and several public gardens and walks. From Gutteridge Gardens, located near the centre of Wynyard, there is a board walk along the banks of the Inglis River to Fossil Bluff, or to West Wynyard. Also near Gutteridge Gardens is the Wynyard wharf, where it is possible to select from the fishing fleet's catch. A short walk or drive from the Wharf, just behind the main street, The Wonders of Wynyard Exhibition Centre, home to the Ransley Veteran Car Collection, incorporates the Wynyard Visitor Information Centre and is open 7 days a week from 9am to 5pm. To the west of Wynyard is the blue water and white sands of Boat Harbour Beach, and an hours drive from Wynyard is the town of Stanley. Wynyard is also a good staging point for travel to Strahan and the west coast (2:15 away) and Cradle Mountain (1:20). The town has two four 4-star, four 3½-star (RACT rated) and backpacker accommodations.